As an appetizer before binge-watching our way to catching up on HBO’s series, we watched the movie version. I was surprised how simplistic and primitive this was. It plays more like an early prototype for Jurassic Park than anything else, with Yul Brynner as a bald, stetson-wearing velociraptor. But unlike Park, which had a fair amount of philosophical, albeit shallow, ruminations on our meddling, e.g. “Your scientists were so preoccupied with whether they could, they didn’t stop to think if they should,” there’s not much going on here beyond basic science phobia. On the plus side, it is free of irritating kids that will have you rooting for the techpocalypse. That’s probably because this is an adult-focused theme-park, with three sections, Medieval World and Roman World, in addition to what the film calls “Western World,” a curious discrepancy from the title which bugged me far more than it should. Into this last, arrive noob Peter Martin (Benjamin) and his friend John Blane (Brolin), who knows his way around the robot staff. Peter is initially somewhat uncomfortable in this land where you can apparently do absolutely whatever you want, with no repercussions. However, as with everything else, these moral aspects are not particularly of interest to the movie. Instead, the focus is a problem with the staff, increasingly not behaving as they should. 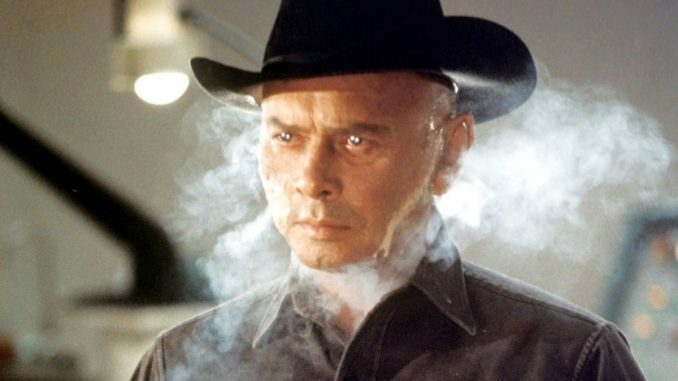 It’s a real problem since many, such as the Gunslinger (Brynner), have been deliberately programmed with violence in mind. In my mind, this is inextricably linked with Soylent Green, another slab of dystopian SF cinema from the same year, even though the movies don’t have that much in common. 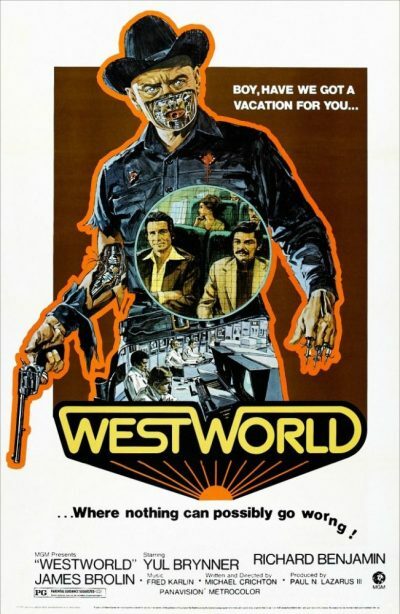 You can’t deny the influence Westworld has had, with the Gunslinger an acknowledged inspiration for Arnie’s performance in The Terminator, and the very early use of CGI to simulate computer vision reminiscent of Predator, not least in the plot significance of infra-red vision. The refusal of park owners Delos to close things down, despite the requests of those aware of the threat, also feels like a precursor of what happens in Jaws. It’s not actually very interesting by modern standards, with its most memorable aspect the wildly inaccurate view of technological advances depicted. The future, it appears, will have no keyboards. Tape drives and giant, cube-shaped monitors, however, will be plentiful. The bulk of the second half is a chase scene which has Peter pursued, with relentless stoicism, by the Gunslinger, and what stands out there is the almost complete lack of dialogue, almost unimaginable these days. Otherwise, I couldn’t help feeling that almost all of the other aspects have been replicated more effectively elsewhere, not least in the films previously mentioned. Certainly, in even just the four episodes aired thus far, the HBO series does a much better job of both describing and exploring the ethical dilemmas, on both human and robot sides, that this barely acknowledges exist.